My little city is a soggy mess, y'all! I know that Irene seemed like a joke to those in FL and LA. But let me assure you, she was a fierce lady who has taken New England by storm. To recap, in one tiny little week, quaint New England mountain towns experienced an earthquake, a hurricane, tornadoes and flooding and mud slides. In the same blasted week! The only conclusion is that snow storms are easier. Less dramatic. Quieter. I live just a few blocks from the Hudson River and just before the first lock. 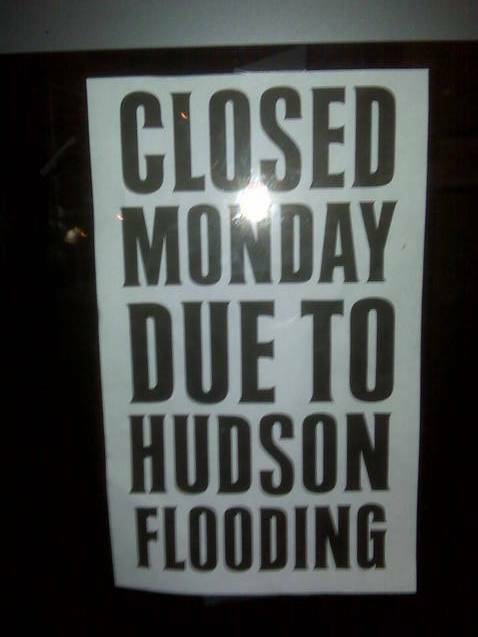 That means that the Hudson River flows freely from the ocean to my city. With a regularly strong current. 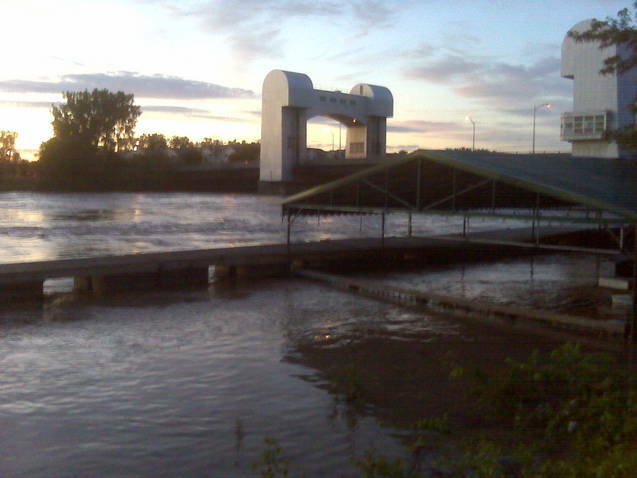 Well that current is sort of a raging river tonight! All bridges are closed still so it takes a stupendously long time to get anywhere. The destruction is just unbelievable. Oh and I drove by the mudslides today and it is just so sad. I've never seen anything quite like that. Warning...all photos were taken @8PM and on my Blackberry. Just trying to set your expectations appropriately low. Ironically it was an incredibly beautiful evening. 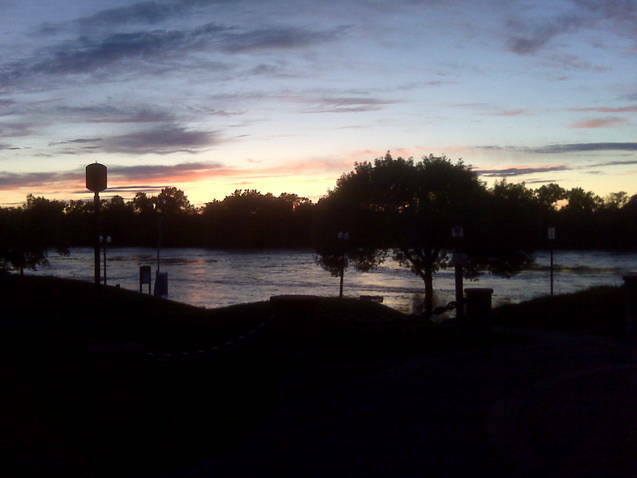 You know, minus the floods. The awning used to be a restaurant patio. We have floating docks so you can see where the water line should be. The awning photo is just to the left. 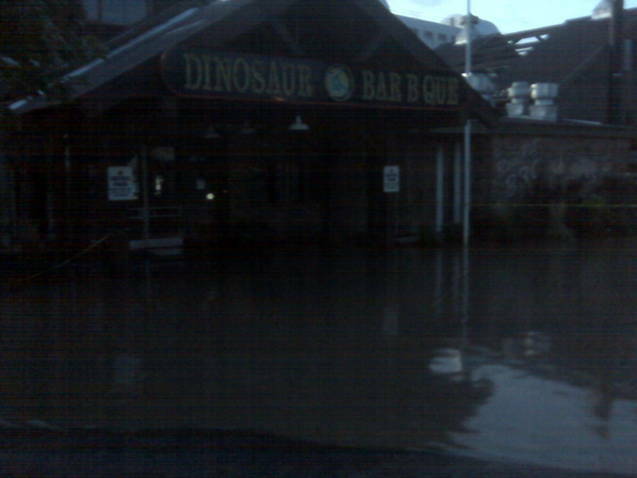 This is the front of the restaurant with flooding straight through to the parking lot. 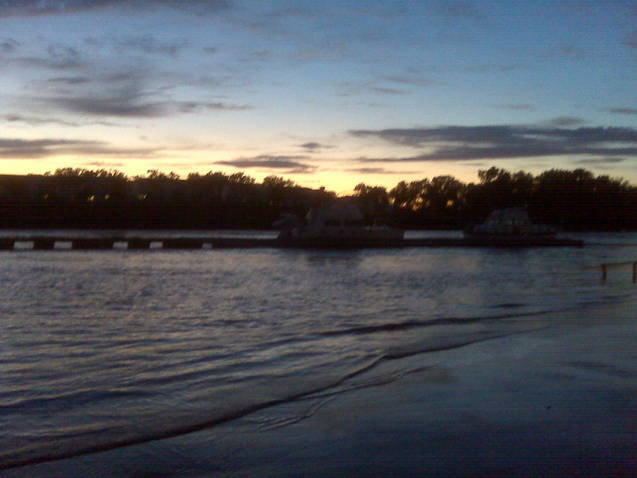 See the boats in the distance and the floating docks? This giant boat is practically inside the restaurant. On a normal Monday night, this street would be empty. But it turned into quite the tourist attraction. Both sad and hilarious at the same time. 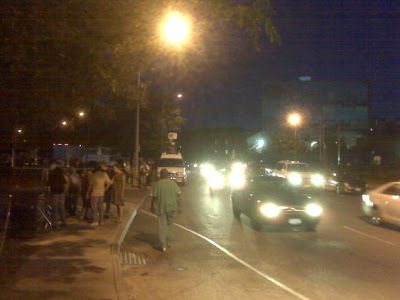 My city is flooded (photos coming shortly), I only slept about two hours last night, I have to do something that will be perceived as hurtful (even though it is truly the right thing to do), I am feeling overwhelmed because I am so behind on one volunteer gig (because I have put in triple overtime on the other volunteer gig), and I witnessed something completely disturbing tonight outside of my home. Now, my home is fine. I am fine. No damage. And I never did have to evacuate. The changed it to voluntary. So I opted not to and everything was fine. I know that the right thing is not always the easy thing in life. I do. But it's still very hard to be in this position. I know I cannot do it all. And it will get done. But probably not by tomorrow morning. Because I am crashing hard right now. Need. Sleep. And as far as what I witnessed...well that one I can't seem to work through at the moment. I just... It was... Ugh...can't even bring myself to talk about it. So gross. My day was not necessarily bad. At all. I am just feeling very overwhelmed and exhausted tonight. As I am crawling into bed and feeling quiet for the first time since early this morning, the strange parts of my last 20 hours are washing over me. Tomorrow is another day. But tonight...I'm crossing my fingers I get some sleep. I shared a link for one of these a few months ago and I think many of us were able to get them. Mine came in a cute little zip travel with lots of samples that I used while traveling this summer. Here's hoping everyone is safe this weekend during Hurricane/Tropical Storm Irene. After both an earthquake and a hurricane in the same week, I could use a little free beauty bag treat coming my way. Sheesh! Y'all know the quote "what if you wake up tomorrow only with the things you thanked God for today?" Well it has really been ringing in my head lately. I've been a mad woman this week. All consumed with my volunteer gigs. Both are now in full swing and I am having a little trouble finding my balance. I'll get there. But it might take me another week or so. 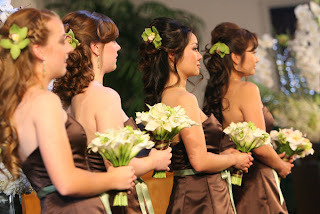 In the meantime, I thought I might share a few things for which I am forever grateful. * My puppy. She is my fur baby. The best part of my day is when she jumps up on the bed to give me good morning kisses. * My daddy. I am not particularly close to my family. And y'all know I've not spoken to my mother in a decade. But my dad is my best friend. * My local girlfriends. I've really struggled to find my roots in this town. And honestly, I am not sure they are here even now. It's not that I live in an unfriendly area. It's actually incredibly nice and friendly up here. But you absolutely will not fit in if you are not married with children. It's a family oriented part of the country. And well... 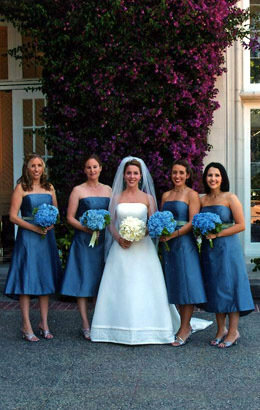 But I have made a lot of really sweet girlfriends through my volunteering gigs. Especially the League. I am so grateful for the conversations and giggles that we get to have at meetings and happy hours. * My besties. They are my soul mates. Love love. * Summer. I never thought about summer as anything more than a school break growing up. I mean, I'm from Fort Lauderdale, FL. Summer is the same as any given Tuesday. But up here, in the North Pole, summer is celebrated. You find any reason to be outside, even if you sweat your fanny off. And things grow. Like tomatoes. You can wear flip flops. And sundresses. No layers or coats required. 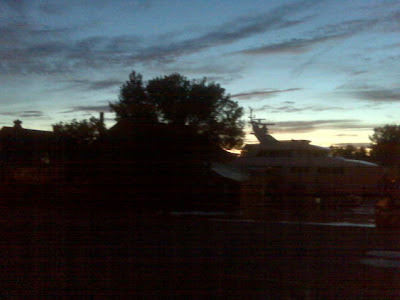 And it's light outside so late. That might be one of the best parts of summer actually. * McDonald's Diet Cokes. I try not to drink them very often. But mmmm they are sooooo yummy! Crack in a cup. * Lippy and hand lotion. I must re-apply lip balm and hand lotion a dozen times a day. At least. * My blackberry. I like talking to people in person, via email or BBM. I am not a big fan of phone chats. But I appreciate that I can do it all and then some on one little pink piece of plastic. * Good undies. Try going through your day in bad undies. It's a make it or break it moment when you are standing there in front of the underwear drawer each and every morning! Choose wisely. This was the first year I've had enough extra tomatoes to both give them away and make salsa. Exciting! 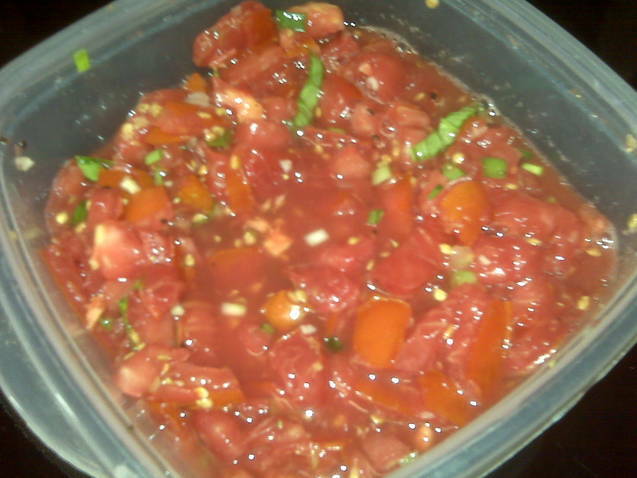 I decided to just use what I already had in my garden so this is bit more like a bruschetta topping than a salsa I guess. There's no heat in it. But it's sooo yummy that I really didn't care. I may or may not have gotten out of bed and stood in the kitchen at midnight eating this with a spoon. I happen to prefer my salsas to be chunky monkey. But if you like yours to be more like they serve in restaurants, simply run half or all of it through a blender or food processor. 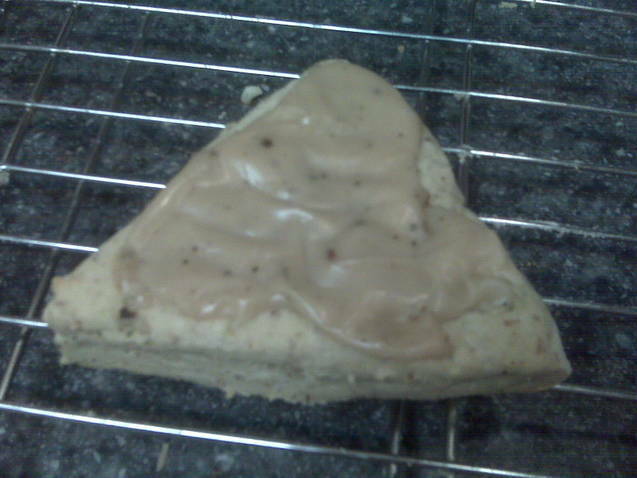 And like many things, this is best served the next day after the flavors have had time to meld together. Also, if cooking/doing things in a kitchen intimidates you, a salsa is a good place to start. I get a lot of comments and emails about how you can't cook. Well in this case, you don't have to cook anything. You can mix and match ingredients. And there is little effort involved. If you like a little heat, add one jalapeno, seeds removed. If you like a lot, don't remove the seeds. If you like a hint, use just half. If you like the hot and sweet combo (my personal fav), add both the jalapeno and either an orange or a peach or a mango. If your cilantro grew well this year, add it. If yours did not (like me! ), add whatever did grow well. Again, it's so forgiving that you really can use whatever you have on hand. My only other note is to not omit the salt. That is a pet peeve of mine, when people omit salt from healthy homemade recipes because they are trying to cut back. Cut back on processed foods and potato chips. Not on a dash of salt in a garden salsa. * Core and chop the tomatoes as large or small as you like them. Add to bowl. * Cut white and green parts of scallions or onion. I use kitchen scissors to chop scallions. Add to bowl. * Cut up any herbs you want to add. In my case I added some basil. Add to bowl. * Add fresh pepper and kosher salt to taste. You will need more than you might think. * You can serve immediately but it is going to be better they next day after sitting in the fridge overnight. I thought this was delicious. But I like sweets with fruit. I once had a friend tell me that he didn't consider it desert if it didn't include chocolate. So I guess you have to decide if you care about chocolate that much. As you might have noticed on this blog, I don't really like chocolate outside of a chip or a brownie. 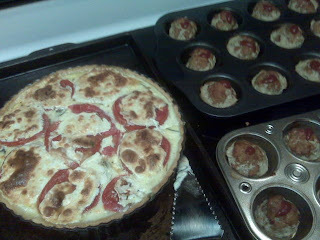 I made up this recipe as I went along but it's this super easy tart crust. Fruit. 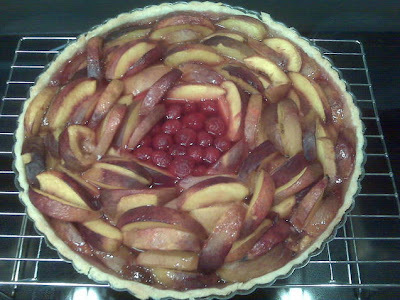 Here I used nectarines and raspberries. And then you need some sort of sweet liquid with cornstarch. And that's it, y'all! Easy as pie. Or tart in this case. It must have been yummy because not a single slice was left. A sign of a successful recipe. 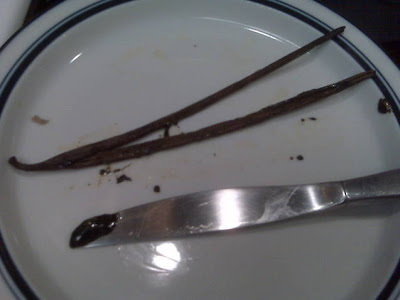 Slice vanilla bean in half and scrape out seeds. 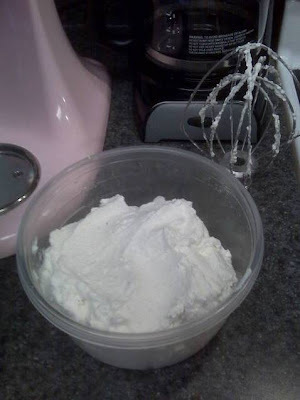 For fun, I added the seeds of one vanilla bean instead of vanilla extract to my whipped cream. A first for me and I thought it was extra fabulous. Though I don't think a single person noticed the vanilla bean specs, I knew they were there! I'm not sure you can really see them on these terrible quality blackberry photos but trust me, the seeds are there. Can you see the teeny tiny vanilla bean seeds? Today is my half birthday. My second least-favorite day of the year. Tick tock tick tock is the only sound I hear. Hmph. Having faith is hard work, y'all! Like exhaustingly hard. As promised, here are a few pics of a cute little order that recently went out the door. 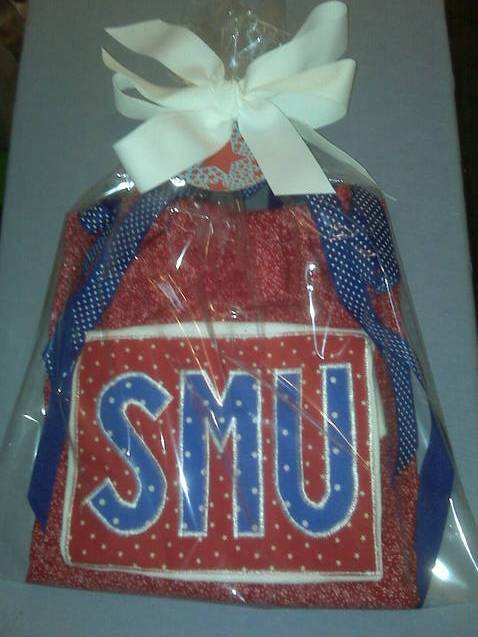 For a brother and sister of SMU alum parents. 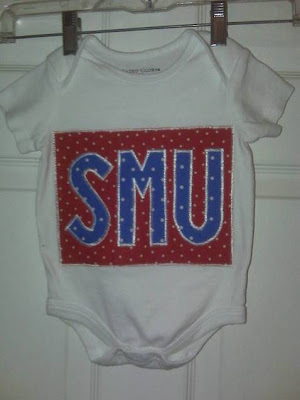 Now that I look at the photos, I am worried that the writing on the onesie is way too big but I guess it's too late now to change anything. I usually line my dresses- this one is lined in just plain white. The lining just gives it a more finished look in my opinion. And I know, I wrap everything in cellophane bags. Not terribly creative but being able to make something cute, quickly is ever so appreciated. Did y'all grow up eating meatloaf? I didn't. And am pretty sure I am the only person in America who didn't. I tasted it several times and never liked it. So it wasn't until I was an adult- a few years ago actually- that I made a meatloaf. For my dad's birthday I believe because he looooves the stuff. 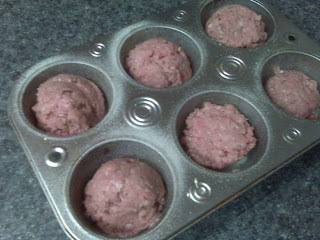 But because I didn't grow up eating meatloaf, I wasn't really sure how to make it. I assumed it was as the name suggested. A bunch of meat in a loaf shape. So my meatloaf and my hamburgers are exactly the same but in different shapes. Meat. In this case, ground turkey. And seasonings. Usually chopped onions or scallions and whatever else I grab in the pantry. I'll tell you my secret to every other thing I make...a little freshly grated nutmeg. But shhhh! It wasn't until fairly recently when I learned that most meatloaf recipes include some form of starch- breadcrumbs, cereal, or even potato chips. Ew. I'm sorry if you make it that way and I now know that is the traditional way to make it. But it just sounds so gross to me. But the thing is that cooking a loaf of lean, ground turkey takes a very long time. I am rarely willing to wait that long. And have solved the problem, thanks to seeing Rachel Ray do this first. 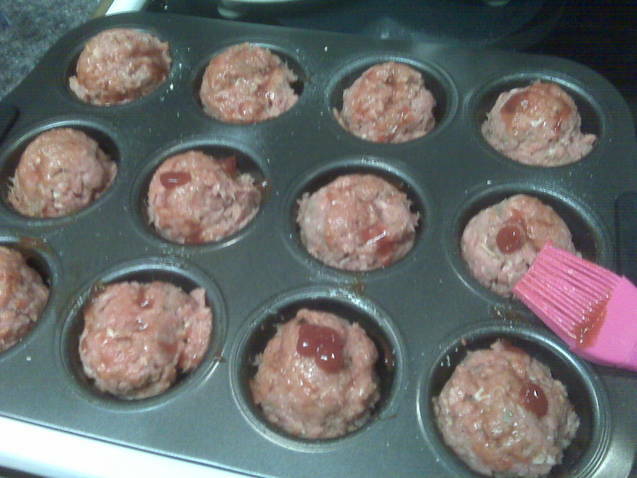 Meatloaf in muffin tins. Or as I call them, meatloafins. (Oh I just think I am so clever. Don't laugh...it just encourages me.) I just use an ice cream scoop to divvy up the meat. I brush on a dot of ketchup. And bake. But keep an eye on them. They cook in a fraction of the time of a normal loaf. They freeze great too if you want to make a big batch and eat them later. In addition to my meatloafins, I made the most spectacular gluten free tomato tart. 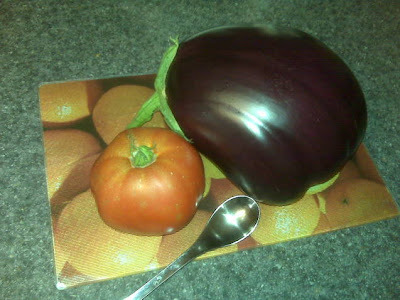 Because all of my t'maters are suddenly ripe. Like on the same day. And I have to say, this was my best gluten free pie/tart crust to date. I changed things up but it really worked and tasted amazing! Which was a relief because as usual, I made the thing up as I went along. The recipe should work fine for regular all purpose flour but I was adjust the liquid down- start with just a few tablespoons at first. * In a food processor, pulse the GF flour blend, salt, and sugar a few times to incorporate. * Add half the butter. Pulse several times. * Add remaining butter. Pulse and SLOWLY add water. Add water just until a dough ball forms. Remember that you can always add more water but it's impossible to remove it. * Dump out onto plastic wrap and form two flat disks. Wrap individually and let rest in fridge. * You will only need one for this recipe. Wrap well and label the other. Pop in freezer for later use. * After allowed to chill for at least 30 minutes, roll out between two sheets of plastic wrap. This really helped to keep the dough from breaking apart as so many GF doughs have done to me over the past year. * Remove top layer of plastic wrap. Lift second layer and flip into tart or pie pan. * Slice onion and place in microwave safe bowl. Microwave for @3 minutes. This really helps to speed up the cooking time. Drain liquid off. Saute on medium in shallow pan until caramelized. 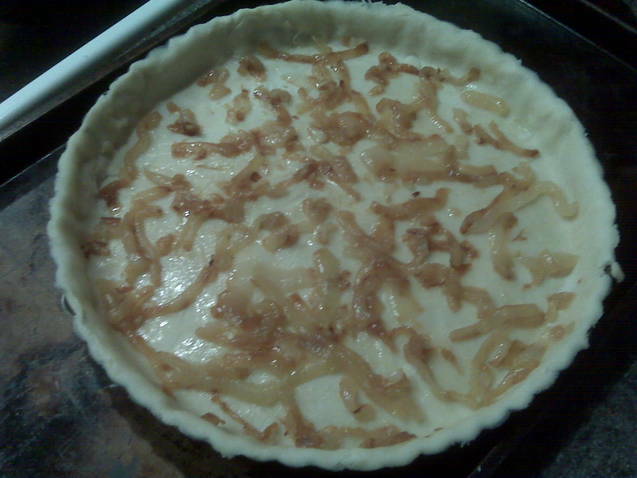 * Place onions on bottom of tart crust. 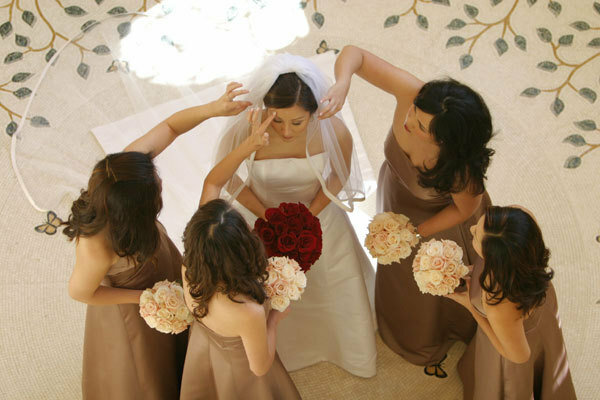 Spread out evenly. 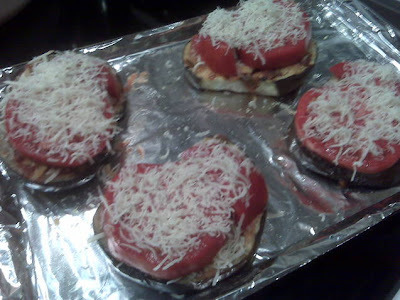 * Add shredded cheese on top of onions. * Add basil on top of shredded cheese. 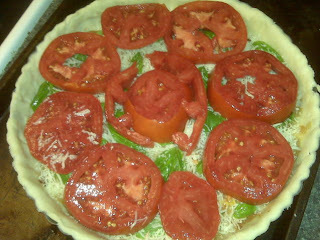 * Add sliced tomatoes. 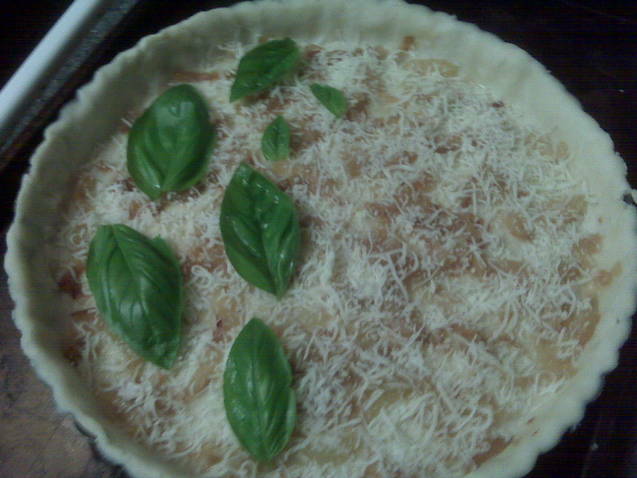 Try to remove the seeds/watery part to so that the tart isn't too runny. That's the one change I will make the next time around. * Top with slices of fresh mozzarella. * In a small bowl, whisk together eggs, milk, salt and pepper. 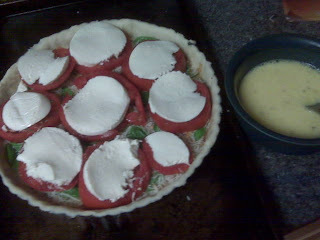 Pour in tart- trying not to get egg mixture on top of mozzarella cheese. * Bake at 375 until done- about 40 minutes. I often refer to dishes as not for company. As in, they are not pretty, even if they taste amazing. I am not sure I would serve meatloaf, regardless of shape, to anyone outside my innermost circle of family and friends. But the tart, most definitely, is a very company worthy dish. It's not even remotely low fat. But it's so different and tasty. Try it. Everything about it was simple to make, but I think the end result is quite pretty and flavorful! I must say, I used up nearly every ounce of that giant watermelon! I wasted very very little. Which is sort of amazing when you think about how much normally gets tossed when you eat a melon. I made a second batch of pickled watermelon rind and finally got around to making a batch of watermelon jelly. 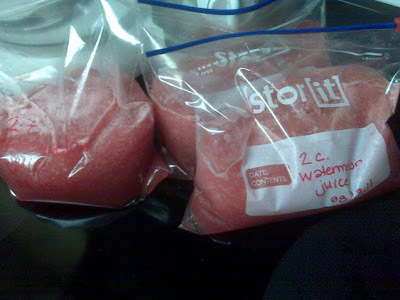 I actually have more watermelon juice saved in the freezer in case I want to make more jelly or give it to friends who are itching to make some watermelon margaritas. Should you find yourself with a gargantuan watermelon too, here is a very simple recipe for watermelon jelly. And compared to the rind recipe, it's super duper speedy too. * I used two kinds of pectin. 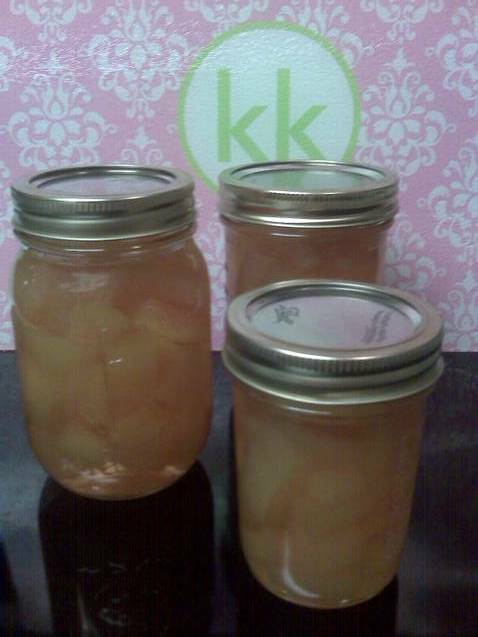 The recipe I based mine from said to use the box pectin, a first for me. But it didn't quite gel enough. 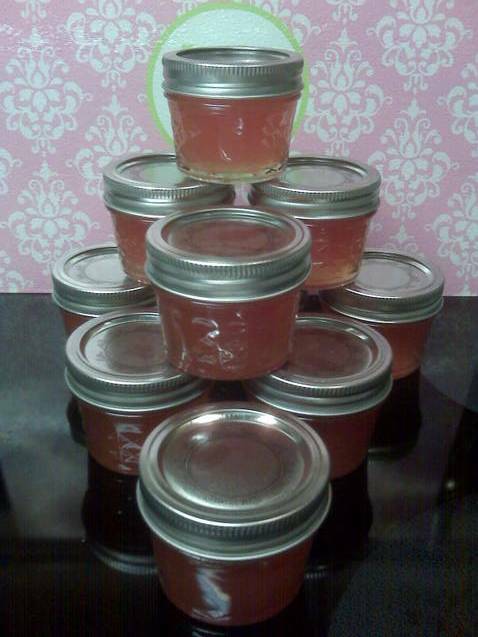 So I used what I had on hand, a pouch of liquid pectin. In the end, I used both a box of powder dry and pouch . 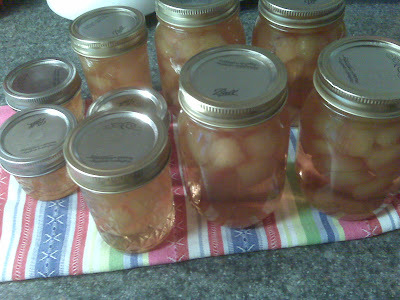 Most who have made jellies before know that you sort of have to play the pectin thing by ear. Sometimes things gel exactly as planned and then...well sometimes you end up with sauce. * I heard a tip years ago that I keep forgetting to pass along to any new canners out there. When making jelly, towards the end to test how well it comes to a gel, keep a metal teaspoon in a glass of ice water. Dry off the spoon and dip in the boiling jelly. In less than a minute it should come to room temp and you will be able to see how thick you've made it. If not thick enough, that's when I add the second thing of pectin and cross my fingers that it works. * Perhaps this is stating the obvious but I am going to say it anyway. 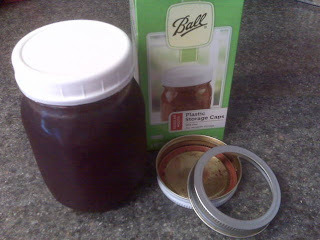 When doing any sort of canning, especially making jelly or preserves, timing is critical. Make sure you have all of your stuff in order and ready to go. I like to make sure my jars or all washed and starting to sterilize in the water bath before I start cooking anything on the stove. Jars can always hang out in the boiling water longer if needed. I also make sure I have all of my ingredients out and ready to go. There is often just one minute between not ready and ready when making a jelly. Don't go walking away to fold laundry or start another project until you are finished and the jars are in the water bath. * Lids, the flat metal disk that touches the glass jar, can only be used ONCE. Everything else, the jars and the rings, can be used for a lifetime. But lids are a use one time only part of the process. OK enough ramble... You get big bonus points if you are still reading. Here's the very easy and tasty recipe. I don't like watermelon but I actually think the jelly tastes really lovely. I mean, honestly, it's like candy. 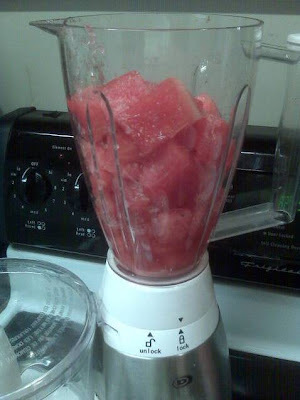 * Place watermelon in a blender. 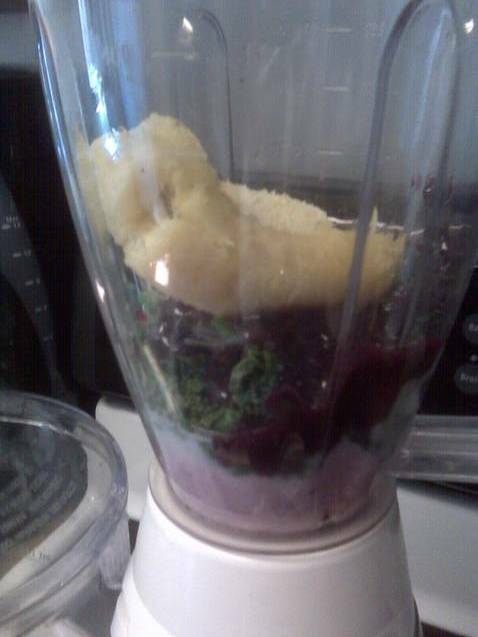 Blend until all liquid. *At this point you can either use a jelly strainer (too fussy for a girl like me but if you have one, go for it), cheese cloth (still too fussy), a colander just to make sure you get the seeds out (my chosen method) or nothing at all because you know all the seeds are for sure out. 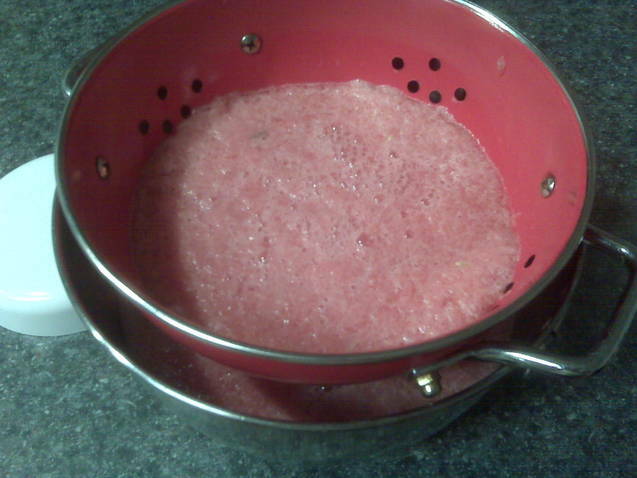 I strained the liquid through a colander just to make sure any big chunks or seeds were taken out. You can see from the photo that my jelly came out clear just doing this method. 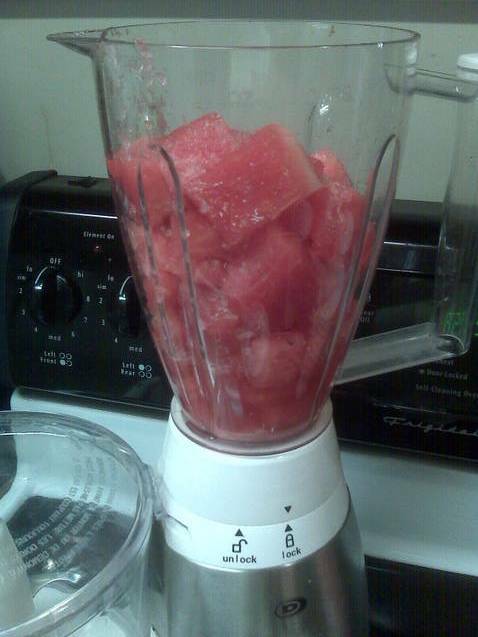 This should result in two cups of juice. That's how much you need...TWO cups. * In a bowl, mix 1/2 cup sugar and the box of dry pectin together. * In a large pot, boil 2 cups watermelon juice, lemon juice and pectin/sugar mixture over medium heat. It should take about 5-10 minutes to come to a boil. Make sure you stir often to prevent burning. * Once at a full boil, add the rest of the sugar. Bring back to a boil. Bring to a hard boil for one full minute. * After it hard boils for a minute, test to see if you are happy with the jelly/pectin situation. If you are not, add more pectin now- start with part of a package if you are worried. Bring back to a hard boil and test again. * Funnel into sterilized jars. Add lids. Add rings. Place in water bath. Once at a boil, boil for 10 minutes (or more depending on your sea level situation). And there you have it. Easy peasy. I think the jelly will be excellent over a brick of cream cheese, on toast or even on a meat such as pork or as a ham glaze. I have a strange love of canning. When I was a little girl, we would come up here to visit my grandmother and pick buckets of raspberries for jam. This was back in the 80's when it was still thought to be OK to seal them with paraffin wax. Which fascinated me, by the way. But as an adult, how gross. It's like a jam and a candle in the same jar. Strange. Then when I lived in DC, Little taught me to make red pepper jelly. Only it never jelled (or is it gelled?). So we made a huge amount of red pepper sauce. Which I used to top chicken for a while but eventually it got thrown away. Because really, how many jars of red pepper sauce can one single girl use? 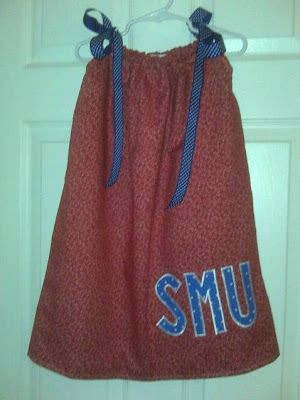 I didn't can again until a few years ago when I became a little obsessed with making things. The entire process fascinates me. I know, so strange. Especially when you know that I don't eat much that I make. 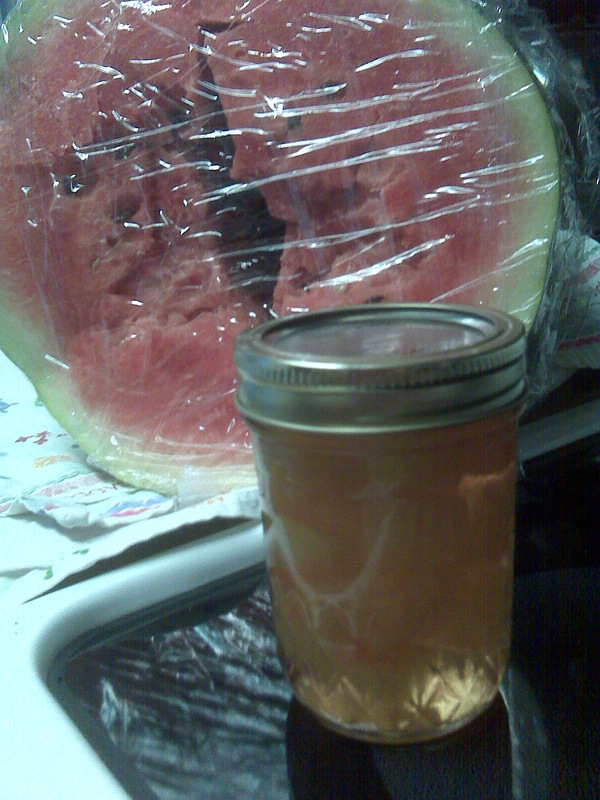 Which is why I was excited that the watermelon rind pickles turned out so well because I love them. However my dad does love my jams. And uses them almost daily. But his complaint is that the tops of the Ball jars are a pain to use. I totally agree- they are a royal pain. This year though, I spied a new (to me) product by Ball. Screw on plastic jar lids. These are for use after a jar is open- so after you have processed with the normal lids in a water bath. To make it easier to get into- just like a regular store-bought jar. I know it's a small find. But I just love when something little and inexpensive makes life easier. I think they were @$3 a box (eight in a box) at Walmart. This has been an issue for me for the last many months actually. On all of my blogs- not just PPC. I will schedule a post. Double and triple check that it is in fact scheduled. And then when it is supposed to pop up....nothing happens. When I realize it's not there, I go check to find out the post mysteriously switched it's status from "scheduled" to "draft." Happens all. the. time! Is this happening to anyone else who uses Blogger too? I know everyone swears that Wordpress is better and more reliable, but I am a total creature of habit in life. I know how Blogger works (or should work) and I like that comfort. I also like the follower feature as that is one of my main ways of reading blogs. I really do not want to switch over if I can help it. I feel like we are so great at helping each other out with our various blog technical issues. So does anyone have any advice on this newly annoying issue? Savory And Sweet Scones .... And They're Gluten Free, Too! I stumbled upon this recipe not that long ago and have been dreaming of the scones ever since that first read. They looked delicious. But of course, I made a few changes. Mostly because I had different ingredients on hand. I've never actually seen a green garlic so I had to improvise on that front for sure. And because I was dying to try a new ingredient that just arrived in the mail. For fun, I ordered several new gluten free flours. Including plantain flour. Alone, it does taste faintly of plantains. Which by the way, are not bananas, for those who didn't grow up eating Cuban food the way NY/NJ folks eat Italian food. I will be sharing my thoughts on the other fun new (to me) ingredients that I ordered as they get used in recipes. But back to the scone recipe. It's good. You should make it. How's that for a review? I ate one with dinner but then ate one the next morning for breakfast. Even though the dough is savory with the chives, black pepper and garlic, the glaze is sweet. It's really a perfect contrast. And please, for the love of food, only use pure maple syrup. Pancake syrup is not the same thing. Actually, it's completely gross. The original recipe notes that you should let the flax meal soak for a bit. And I must say, this was a big ah-ha moment for me. I've been adding flax meal to my recipes for more than a year and while I love the flavor, it leaves muffins and such rather dry and gritty. 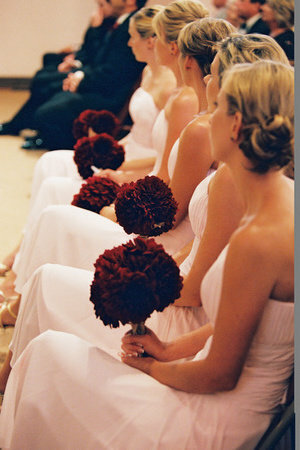 Allowing them to soften and absorb the liquid totally changed them and I have vowed to do that every time from now on! So this is the recipe I used with one exception. I am noting the amount of chives I will use next time. I used less and think it would be even better with more. Also, don't call the foodie police, but I only ever use salted butter. There, I admitted it! So I adjust my salt accordingly. If you are better than me and use unsalted butter, add in more salt than this recipes notes. If you don't have some of the flours, just sub in what you do have on hand. Or use all gf flour blend if that's what is in your pantry right now. And if you live gluten full, you should be able to use normal AP flour. 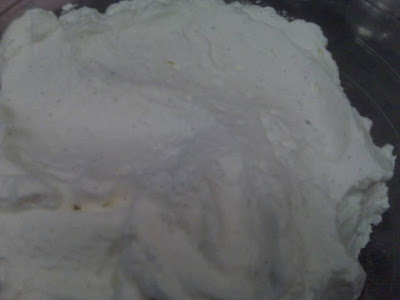 * Mix sour cream, eggs, egg yolks and flax meal in a bowl to allow flax to soak up some of the liquid. Set aside. * Mix flours, salt, pepper, chives, and garlic in mixing bowl with whisk or in food processor (my chosen method) until well blended. * Add in egg mixture. It will be quite sticky. * Dump out on well-floured counter and divide in half. Form two round disks and cut into 6-8 wedges. Place scones on a silpat or parchment lined baking sheet. Brush top of scones with egg wash or milk (I used milk). Bake at 350 for 18-20 mins. * When scones nearly finished baking, microwave butter and maple syrup until melted. Mix in confectioners sugar and pepper. You might need to pop the mixture back in the microwave for a few seconds to make sure its runny. Top scones with mixture. * Enjoy warm or room temperature. Getting ready for bed last night, I remembered that the lotion bottle on my nightstand was empty. Time to grab a new one from the closet. So I pulled out a new bottle and tucked myself into bed. The older I get, the drier my skin gets. If you had told me that ten years ago, I would have laughed out loud. But it's completely true. So I have lotion everywhere. Two in my purse, bathroom, bed side, kitchen, desk, sewing room and so on. I just hate the feeling of dry hands. I also coupon shop. I say that to note that I happen to have several bottles (er...like 4 months worth) of lotion in the closet at all times. But there are a variety of brands. So the bottles are all different colors and shapes. OK so I am in bed and I reach for the new bottle of lotion. I slather it not only on my hands and arms, but also all over my face and neck. And while the scent is nice and the thickness seems good, it's also very sticky. Like too sticky. Like it's not drying sticky. I grab the bottle to see what kind of lotion I bought only to realize it's not lotion. It's body wash. I just got into bed with nice, freshly cleaned sheets and slathered liquid soap all over myself! So out of bed I popped, careful to touch as little as possible, and stumbled into the bathroom to wash off. And then to the closet to find some actual lotion. This, my friends, is why I will never be Kate Middleton. I am fairly certain that a princess would never slather her face up with body wash while laying in bed. I mean seriously, this is my life. Stupendously ridiculous. With a lovely fresh scent. The story. It's not really earth shattering. But for me, is still makes me smile. So when I first moved to DC a gazillion years ago, my Bestie Little moved there too. I like to do things in tandem in life. We were both nannies and still entertain crowds with our wild stories. Ha. But over Labor Day weekend, we decided to take a little road trip. Just to get away for a few days. Two girls and two dogs. Yes, because we both had dogs. Actually, the family I worked for is the reason I have Sadie. They wanted a dog and so did I. But they didn't want to have the responsibility of caring for the dog. So the mom pushed for me to get one instead. That August is when my fur baby came into my world. But that's sort of off topic. Anyway, Little and I went on a road trip to Pennsylvania. Why? 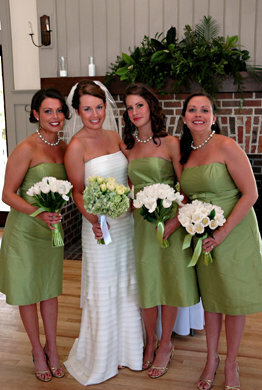 Because she is from the mountains of GA and had never been to PA. She wanted to cross another state off her list. So off we went to a cute little Bed & Breakfast for the weekend. Because that's how we roll. Just out of college and off to a B&B. I'm telling you, Little and I have forever been old souls. The dogs loved it. We loved it. We took little day getaways to see fun sights. 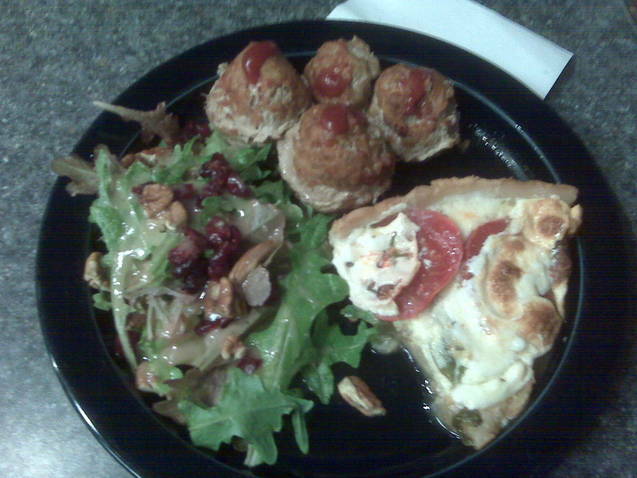 Ate great food. And at one little out door cafe that allowed us to have the dogs sit at our feet, they offered some pickles as a little nibble before dinner. Including watermelon rind. Now let me preface this by saying that I think watermelon and cucumbers are garden mistakes. So gross. I can't even get myself to taste them because the smell just completely overpowers me with ickiness. But not one to turn down trying new foods, I popped one in my mouth. Oh how fun! It was a little like a square sweet pickle. Tangy and sweet and spicy and crunchy and just so fun. Little said they were a southern food but to date, I have only ever seen them up north. So I actually have a feeling that they are more of a Dutch/Amish thing. That trickled down south. Regardless of what community claims them, they are really good! 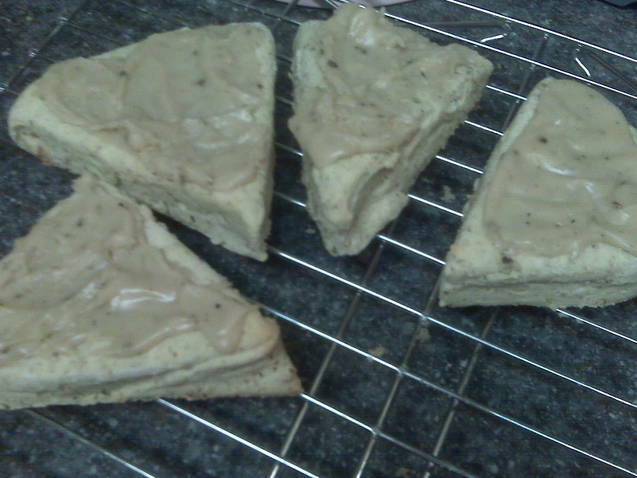 And I have wanted to try making them ever since that first bite almost exactly nine years ago. But I was intimidated. 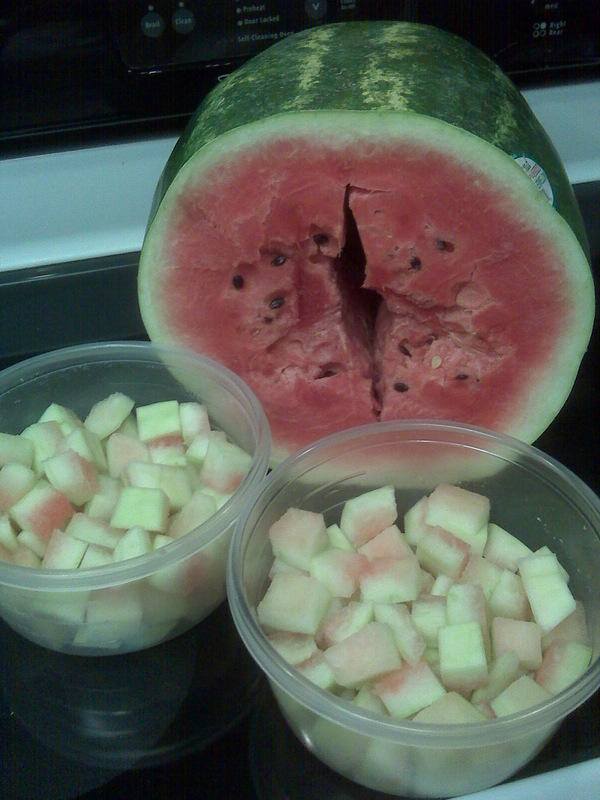 Since I don't like watermelon, I've never before purchased one. They looked heavy and hard to maneuver. (And I was right...they are.) It looked impossible to peel away the green outer part to reveal the white rind part. (It's not. Just takes time and a good peeler. Which incidentally, came in the form of a Christmas gift from Little a few years ago. Full circle moment, my friends.) And the only other time I made a pickled anything was a few years ago when I made dill pickled green beans. Which were a total flop. I followed that recipe to a T and they just tasted like vinegar. But today is a Pickle Party. I love a good party, even if I will never meet the other guests. So I took this on as a personal mission to make me some jars of pickled watermelon rind, y'all! The verdict...a total success! With a bonus drink recipe at the end too. So this one is a tip of my hat to you, sweet Little! I miss you! * Gently wash your watermelon with cold water and NO SOAP. * Make the brine: combine 3/4 cup salt and 3 quarts water. Mix well. * Prep your melon. Trim away all of the pink flesh. Give this to a friend or relative who isn't grossed out by the smell of watermelon. Then use a vegetable peeler to remove all of the green outer skin. You just want the white rind part. Cut into 1 inch cubes. 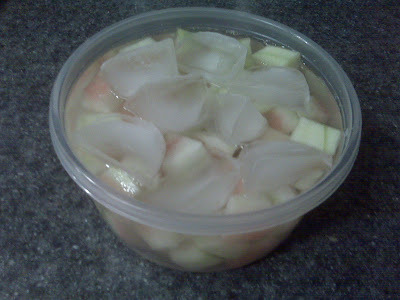 * Place the cubed rind in a container large enough to hold it plus the brine solution. I needed to use three containers to fit it all in my fridge. 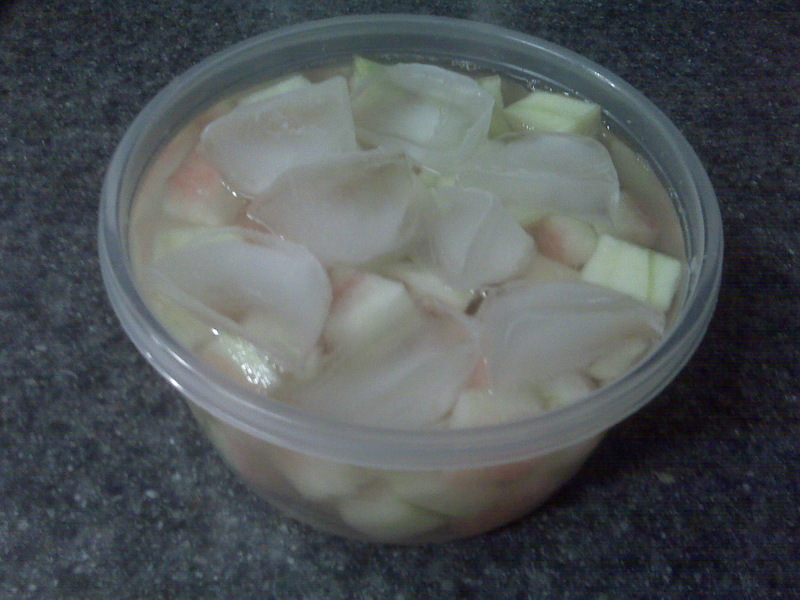 Then place the ice cubes on top. Place in the fridge for at least four hours. Overnight is best. * Drain and rinse the rind under cold running water. 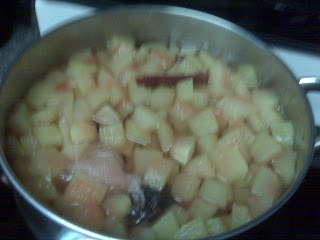 * Bring pot of water to a boil and add the drained rind. Boil for about 10 minutes- just until fork tender. Don't over cook. * Place cloves in a piece of cheesecloth and tie tight. Break cinnamon sticks into pieces. Place in a large pot along with sugar, vinegar and 3 cups water. Bring to a boil. Boil for five minutes. 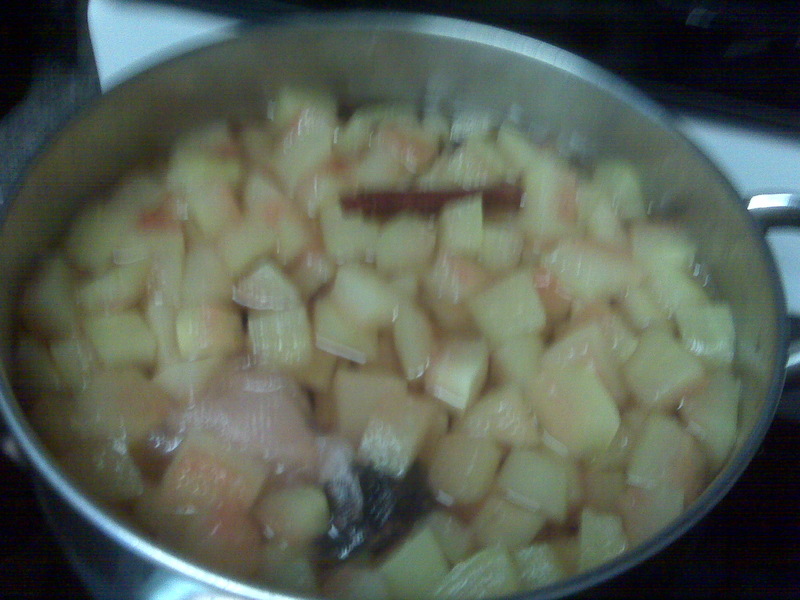 * Carefully add the now boiled until fork tender rind into the sugar/spice pot. Add lemon juice. Bring to a hard boil, then back the heat down to allow the pot to simmer until the rind is more translucent and the liquid is a bit thicker. About 40 minutes. * Sterilize your jars and new lids. Have your tools and rings ready. Get your canner/water bath ready. * Fill jars with rind and liquid, leaving a quarter inch head space. Wipe rims clean with a clean, damp cloth if necessary. Add sterilized lid and ring. Bring to a boil for 10 minutes. (Or check the time in your area if you live in particularly high altitude. Even though I live in the North Pole, I am only a few blocks from the Hudson and therefore only about ten feet above sea level.) Rest on a towel- don't touch them- they're hot and need to pop on their own. * Impress your friends and family with your fun pickling skills! + Do not change the sugar/acid content. I know you gasped when you saw the sugar content. Yes well, just deal with it. If you change the sugar or vinegar or lemon amounts, you are changing the entire chemistry. Don't do that. Keep your food safe, my peaches. Trust me, this is super duper important. + I once read a recipe that I now need to try. Instead of wrapping a piece of bacon around a date or fig, wrap it around a pickled watermelon rind piece. Same idea of salty and sweet together. Bake until bacon is cooked. Sounds amazing if you ask me! + This is NOT a quick recipe. It takes time to allow the rind to brine overnight. It takes time to get all of the components together. 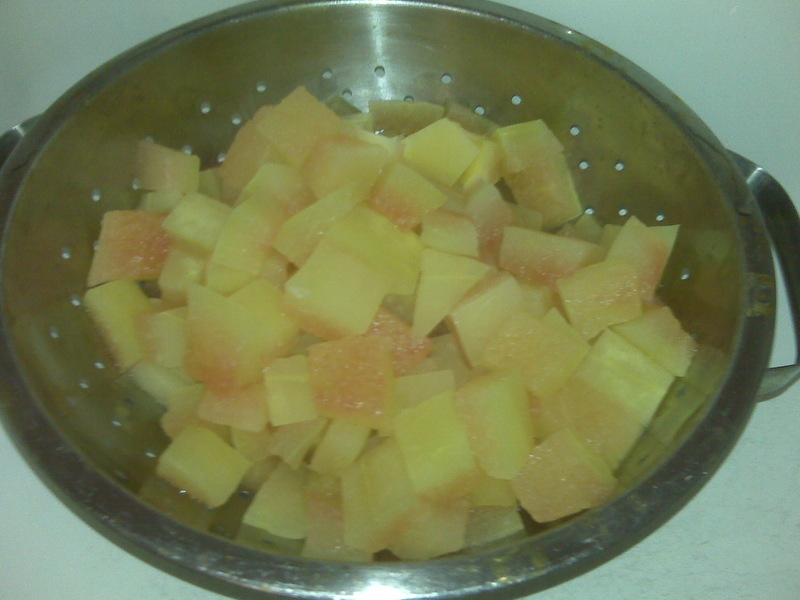 Heck, it takes a lot of time just to cut up your melon. My point, allow yourself time. Don't start this project thinking it will be done in an hour. Not the case here. It's a little bit of a labor of love. But totally worth it, I promise! + And finally, I actually had a good bit of the syrup liquid left over. Never one to throw things away, I saved it in a plastic container. And added a few tablespoons to a glass with seltzer water, ice and a splash of rum (or vodka would be good too). OMG sooo good!! I actually first tried it sans the alcohol and that was super refreshing too so don't think I'm trying to push you to drinky drink. 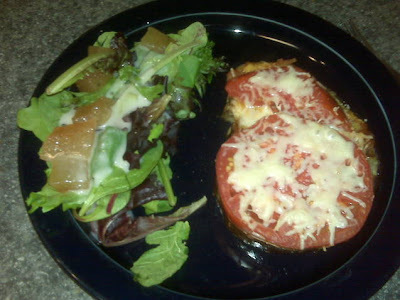 Either way, it was so yummy and a great way to use up something you just spent a lot of time making. I have adjusted the recipe. I originally wrote down 9 cups of sugar. But have since made the recipe again with 6 cups. 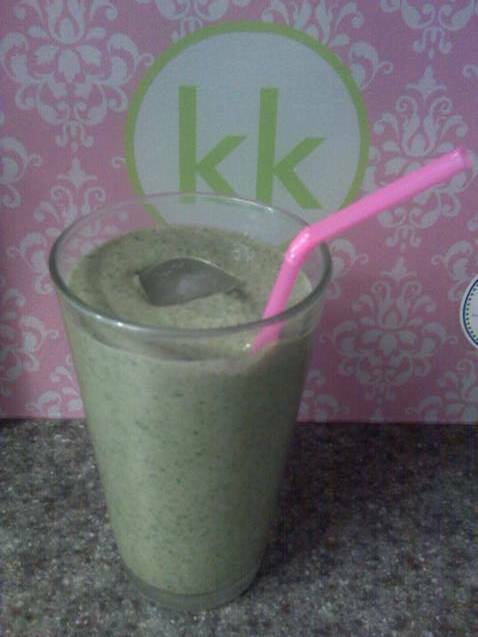 It still tastes great but has a lot less sugar. So taste it at 6 cups. I mean, that's still a wicked ton of sugar. If you like it sweeter, add up to 3 more cups. 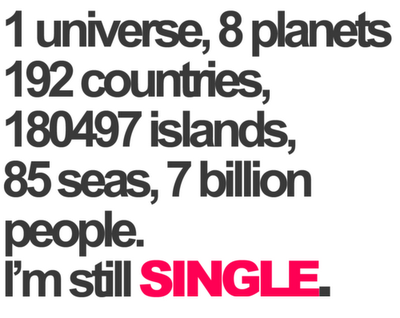 But for me, 6 was plenty.